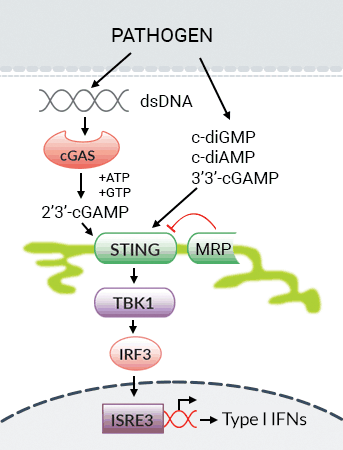 STING, initially thought to serve solely as an adaptor protein for mediating signaling by cytosolic DNA sensors (CDS), was recently found to be a direct sensor of cyclic dinucleotides (CDNs). Interestingly, a variety of natural variants of human STING (hSTING) have been identified. The presence of nonsynonymous variants of hSTING, some in high frequencies is indicative of its implicit role in disease. It is important to be aware that variant hSTING alleles differentially respond to cGAMPs.